Winter is just around the corner and as you know, dry, cracked skin can be a big problem because of cold weather, but did you know that your dog’s skin can also be affected by winter weather as much as yours? It’s true. Your canine friend can also suffer from dry, flaky skin and other winter skin ailments so you should be prepared to treat any dog skin problems that may flare up during the cold months. Coming in from out of the cold can cause dry, flaky skin. To prevent this, it is important to keep your house humidified and to also towel dry your furry friend as soon as they come in from their walk. Be sure to pay extra attention to his or her extremities and especially between their toes. While bathing your pet more during winter months may seem like a good idea, it’s actually not. If you over bathe your dog you may be stripping him or her of essential oils needed to keep their skin from getting dry. During the winter, depending on where you live, you may have to contend with a lot of snow and ice while walking your pooch and if you think it’s bad for you, think of them. You are wearing shoes or boots and not walking directly on cold surfaces. You also don’t have to deal with what in some cases could be harsh deicing chemicals on your feet. Your poor pets will so if you can, try to get booties for their feet. A lot of dogs don’t like having anything on their paws but booties can help avoid possible chemical burns from anti-freeze or salt crystals used to melt ice. If your canine won’t use booties, you can also rub their paws with massage petroleum jelly onto their pads. This will form a barrier that helps protect their pads from getting irritated. A lot of people believe that the dog’s fur is enough to protect them from cold temperatures but that’s often not true. 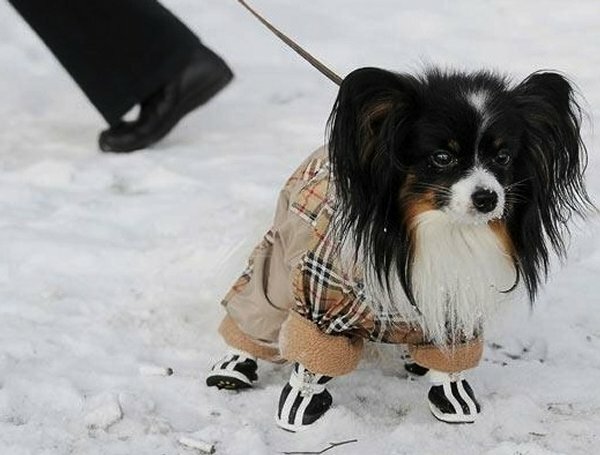 Buy a cute sweater or coat for your dog for the winter. It will help to retain their body heat and will also help to prevent skin dryness from occurring. Be sure to brush your furry friend’s coat regularly. This not only makes them look nice but helps with their blood circulation as well which will improve their skin’s condition and stave off dry spots. If your dog is experiencing any dog skin problems, be sure to visit sites like www.drrosesremedies.com for remedies and products. Faith Stewart writes for a variety of websites. Previous story What Are The Symptoms Of Bed Bug Bites?